In the city that never sleeps, enter the atmospheric interiors of Bar ‘21’ & Lounge to relax and socialize at your own pace. Pull up a seat at the marble bar for delicious bar bites, or have us blend you the perfect pick-me-up. Exuding a fresh, modern allure, the venue’s broad client base all share one thing in common: the sensation of feeling totally at home. Discover tempting treats and snacks at Bar '21' & Lounge. Innovative flavors meet timeless tradition in the drinks available at Bar '21' & Lounge. 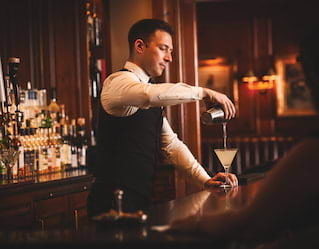 Our friendly staff pride themselves on a cocktail menu that draws crowds from far beyond Manhattan. Don’t leave without sampling our signature Southside, which features Botanist gin, lemon juice, muddled mint leaves, a little sugar and soda.